The reconstruction of railway Corridor VIII, 30.8km-long railway section Kumanovo-Beljakovce begins Sunday.. The cornerstone of the first phase of the project worth over €50 million is laid in Kumanovo. The Eastern Section of Corridor VIII is 88.2km long and divided into three sections: Kumanovo to Beljakovce, Beljakovce to Kriva Palanka and Kriva Palanka to Deve Bair, which is located on the Macedonian / Bulgarian border. 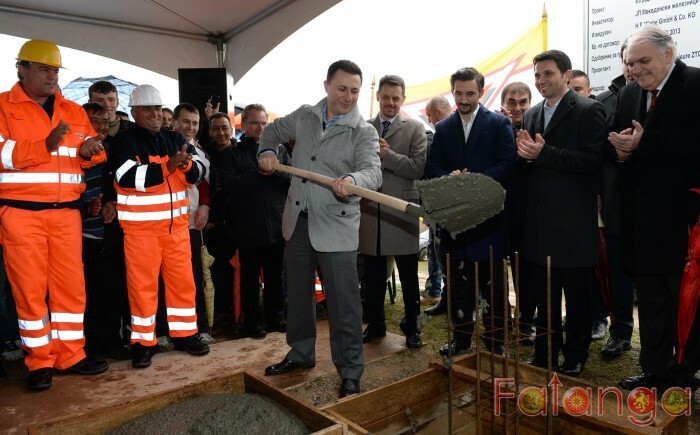 Prime Minister Nikola Gruevski, Deputy PM and Finance Minister Zoran Stavreski, Minister of Transport and Communications Mile Janakieski, railway and EBRD officials attended ceremony marking the start of the reconstruction. Gruevski said that the project foresees full Reconstruction of existing railway at length of 31 kilometres, construction of three railways stations, six stops, several underpasses and overpasses, fences and signalling devices. He said that some of the activities were started in 90's but due to irresponsibility of the previous ruling party the project was interrupted in 2004. The first phase of the project amounts €46 million, the second €145 million and funds will be used from EBRD, EIB and EU IPA funds for the third phase. The Macedonian diaspora to the singers: Don't even think of coming to Canada! Muhic voted 'abstained': The agreement with Greece is contrary to international law!